A ray of hope, finally! I'm pleased to announce this moment for my English diary. As some people already know, I've been writing a journal every day in my second language English... for now more than three weeks. At the beginning, almost nobody was visiting my website. However, as of today writing the twenty fourth journal, now I know that there are more than ten people who wait for a new post from my blog! I'm writing my jouranls on Hatena blog, and I've got 11 subscribers in three weeks. Yeah! The reason I started my blog by using Hatena is because some of my friends told me that it's easier to continue blogging. Also I heard, Hatena blog is popular among people who use the internet a lot so that higher social sharing rate is possible or something even as a personal blogger. As I mentioned earlier, there was almost nobody on my website at the beginning. However recently, there're more than 30 people visiting my website every day. It's not a lot yet compared to what I want and what I know, because popular blogs can have thousands and thousands of visitors every day. Maybe that's happening to my blog too one day? I'm motivated a lot by these "more subscribers" and "more visitors" on my website. I was hoping that from the beginning, and I'm hoping more and more people in Japan will start learning real English. 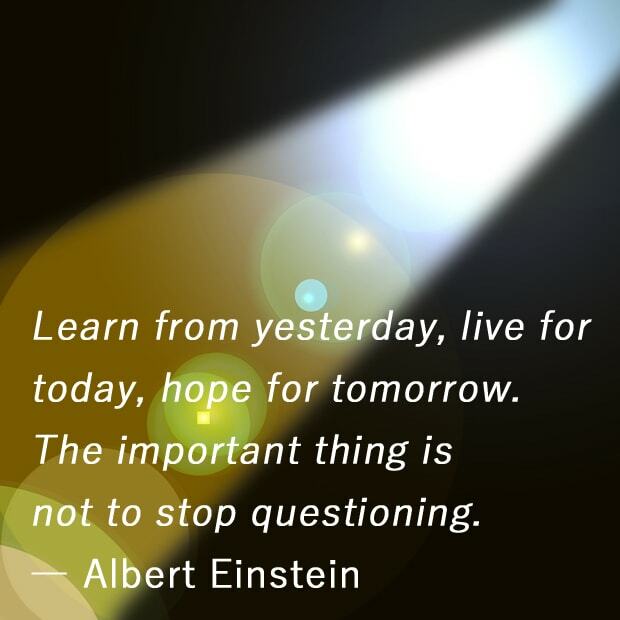 Anyway, the quote I want to introduce you today is by Albert Einstein. It means, I shouldn't stop writing a journal questioning "Maybe nobody likes what I do in Japan..." or whatever reasons. I don't know how many days I'm able to continue writing something interesting really really "every day", but I'll keep doing what I can. I truly hope this website will be of some good help to Japanese people who want to improve their English skills. Well, that's all for today's journal. Thank you for reading till the end. See you next time!